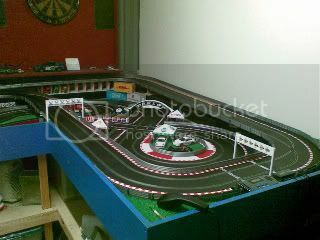 Below you will see a couple of photos of my original track I had set up on an L shaped table (2.9 x 2.4 x 1.2). This track was set up for roughly 12 months before I decided it was time to remove the wall you see to the right of the dart board. 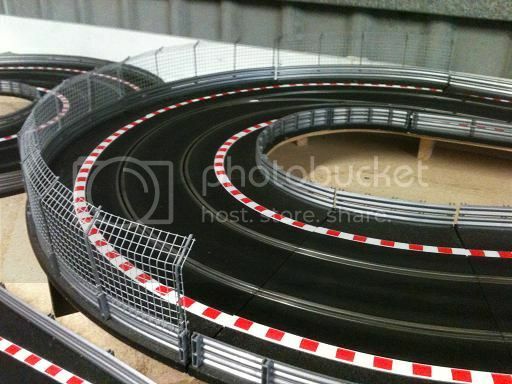 It was tight and twisty consisting mainly of R1 and R2 curves and was approx 20m in length both lanes the same.. These photos were taken with my mobile phone about 5 mins before I started to pull it down. It was fun but I wanted something more free flowing. So I came up with this. 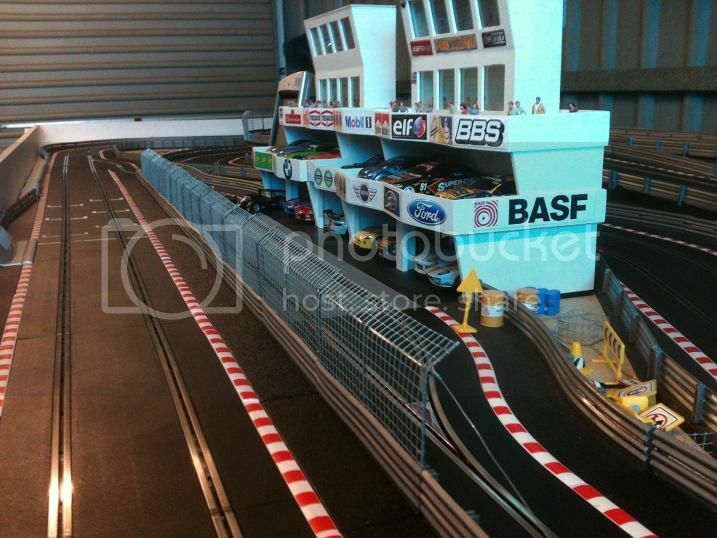 Track is approx 22m lane 1, 21.75m lane 2. Table size would be 5.3m x 1.5m with the top of the table approx 900mm from the floor made up using the 2 sections of my L shaped table, extended by 1.2m and widened by 300mm. I set the track up as to plan. (Can't get it all in one photo though). Before the track was set up I cleaned, tightened all the connecting lugs under the track pieces then soldered 2 full straights with power taps and rebuilt the track. The 2 power taps were evenly spaced around the circuit and wired and soldered to the full straight closest to the powerbase. Before putting a car on the track I cleaned the surface again and applied some Inox to the rails and have had no problems with any loss of power. So far the quickest time around the track is 5.9 sec using my favorite car(Slot.it Mclaren GTR F1). I hope you like my new layout and any feedback whether good or bad would be appreciated. I intend to add some scenery but would really like to put an overpass/underpass somewhere on the layout-any ideas? I use the casters quite often, probably every time I have a crack at the track. There are 10 in total and I can easily move the table in and out from against the wall. Will probably upgrade to better quality solid casters as these were cheap($1 each) and you can see the weight of the table distorting the roundness of the wheel if the table hasn't been moved in a while(Don't know what the weight is but it is quite heavy). 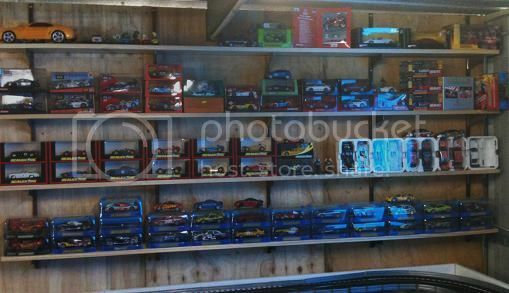 I usually move the table quite often at the moment and it is good being able to access all of the table without having to use other means to reach the cars. 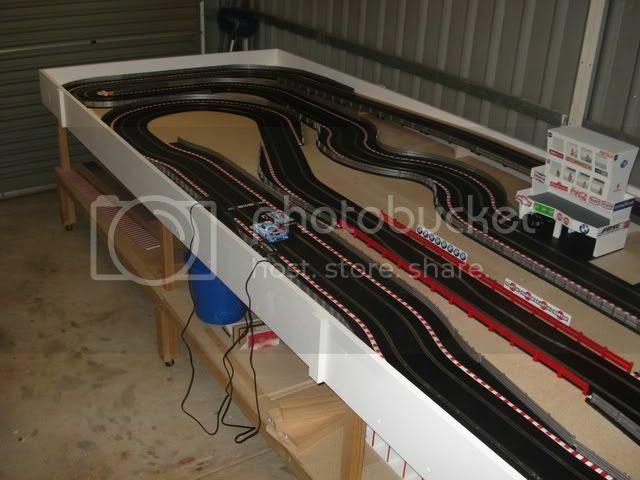 Was great for setting up the track etc and will be good for when I start some scenery. Thanks fellas, will probably do a few little changes here and there over time, elevate more of the track and maybe a bridge,tunnel or two. 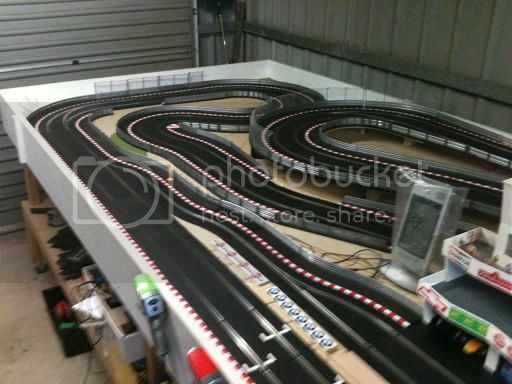 Still hoping to get along to one of the wascrg nights some time soon and see what this wood racing is all about. You're in luck we are racing this Saturday night if you want to come along. There are always a spare car or two just give Dave or myself a call. Thanks Syd, hopefully I can make it along, see what the boss has planned first. Well I thought it's about time I updated my home track thread, actually thought I had quite some time ago but this is as it is at the moment. Upgraded to digital quite some time ago now, using the Advanced 6 car PowerBase, 6 controllers across the front of the table (3 each side of the APB), 3 XLC's, 4 CLC's, SSDC and PitPro deluxe (in and out sensors). 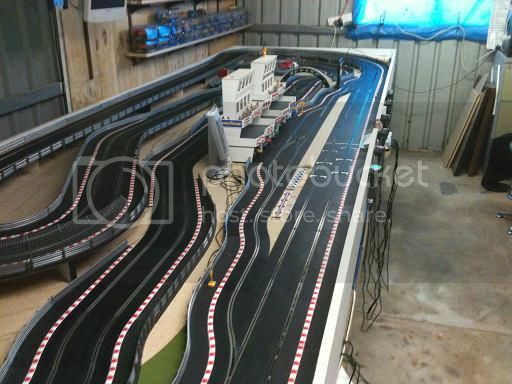 The front straight starts to rise at the first R4 until the top right hand corner before the 1st XLC where it levels out along the back straight, pass the CLC and round the corner where it comes down again to table level. 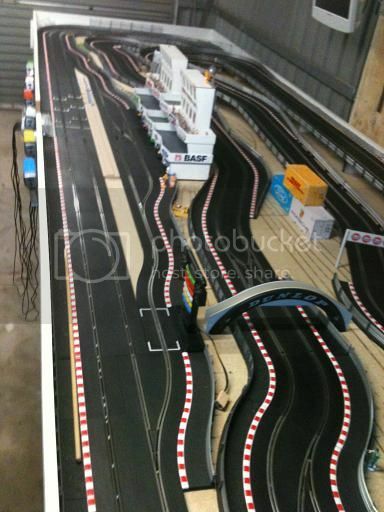 I do like having the R1 bend in the layout to add a slower section but the pace cars don't, so until I can come up with a solution to remove the R1 and replace it with a pace car friendly corner it will stay in place for now, any suggestions on this would be welcome. I would like to actually add some scenery but I'm always busy with other slot related projects and just running laps. Like the layout Matt. Looks like it should be a bit of fun and challenge. Layout looks good... Some good straights in there! On my digital I found r1 corners were prone to causing rear end crashes with newbies... But if you have people using your track of ok skill or better... It probably won't be an issue. your track is loosely similar to mine in shape... Just in reverse!!! The track is only a challenge Embs if you don't know how to slow down for the R1 turn and I always have fun playing with my toys. Most of the time I am a solo slotter, the kids like to run a few laps every now and again and race each other (and they're getting better all the time), and I have the occasional mate round but I never built this track or went digital to try and get more people to come round, it's really just for me,the kids and because I can . 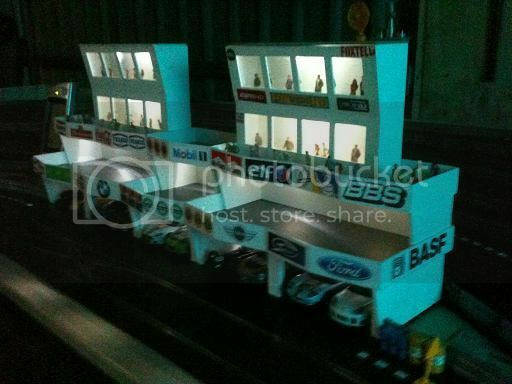 I went digital in the first place to have 6 cars on the track at once and I do like using 5 as pace cars and weaving in and out of traffic, but I've even set all six up as pace cars, stood back with a coldie in hand with the lights off and watched the cars zoom around the track, looks pretty cool actually. I did wire the pits and Helipad up with Leds, 3 toggle switches turn on these, 2 for the pits,upper and lower, and 1 for the Helipad, these help with the night driving but I still need to light up the ends of the track. Here some photos for you Dave and fellow forum members, sorry about the pics not being that clear, they were taken with my iphone and my good camera didn't like going for a swim, gotta love kids. 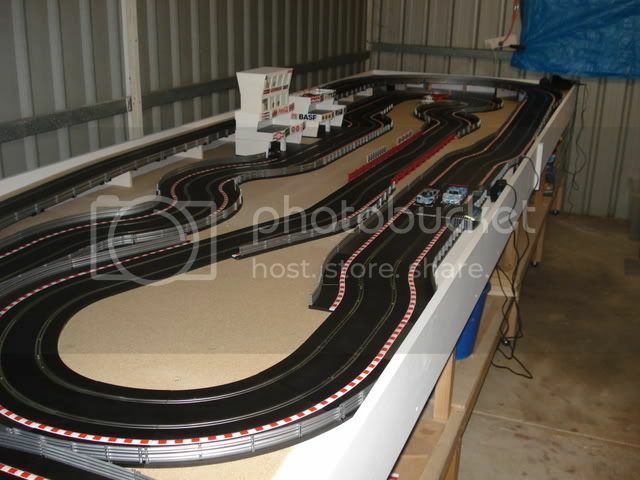 From Left to right and then a couple of long shots to try and show the layout. 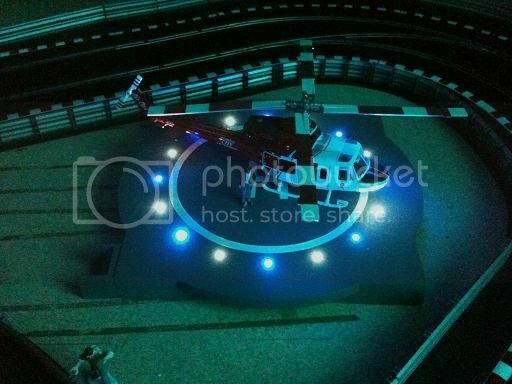 Pits and Helipad lit up. I've had a go at making some safety fencing using metal gutter guard. I would still like to have a tunnel/overpass, maybe if I got rid of the R1's and came under the R2 corner where the safety fencing is, might work, I'm open to any suggestion on improving the track. See, I don't have a problem with R1s. But I'm possibly in a minority there. Get's kind of difficult for a long, narrow layout not to be just zoom zoom up and back a few times. At least you seem to have a bit of change in rhythm in centre of the table. I do like the R1's Embs but like I said the pace cars don't, so unless I have the pace cars in lane 2 and the ones in lane 1 going very slow the R1 bend really needs to go. 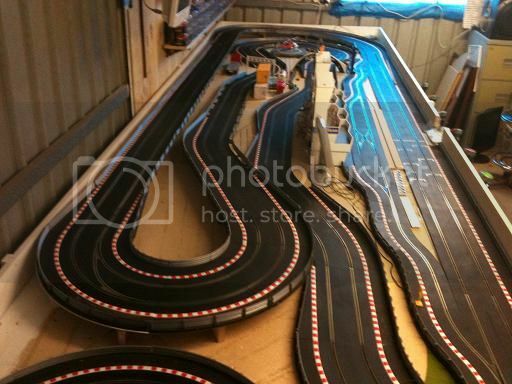 I did have an idea (if you look at pic 6 in my last post) was once the track comes along the back straight and round the R2 bend was to continue the track behind the pits at the same raised height, down and then turn left instead of right and back under the R2's into a better corner instead of the R1 bend, this way I might be able to get my tunnel/overpass. I do wish that I had made the table about 1.8m wide in the first place, would have given me a few more options with the extra width. Edited by mattcrackers, 13 October 2012 - 09:42 PM. You did a good job on that safety fence. My brother and I are going to give our scenery an overhaul and instead of looking like a historic track, make it look a little fresher with features such as 'proper' safety fences instead of guard rail... So are considering something similar. Very neat job on the safety fencing, well done. 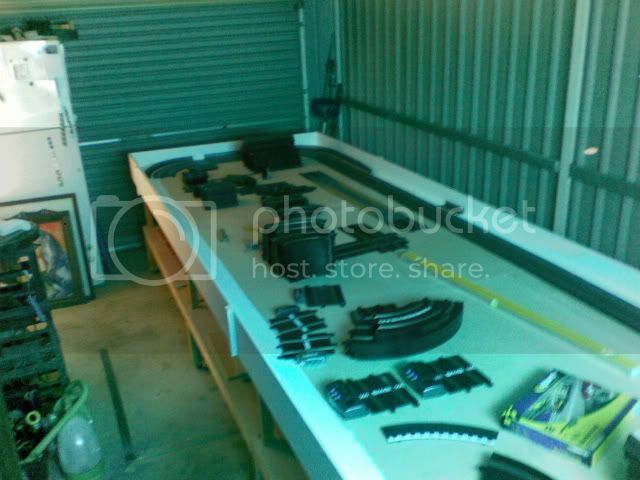 Sorry about the late reply but thanks Dave and Triggy,not my idea as I have seen a few people make up the safety fences out of various materials, came across the metal gutter guard ay Bunnings one day and thought I'd have a go at making some fencing. 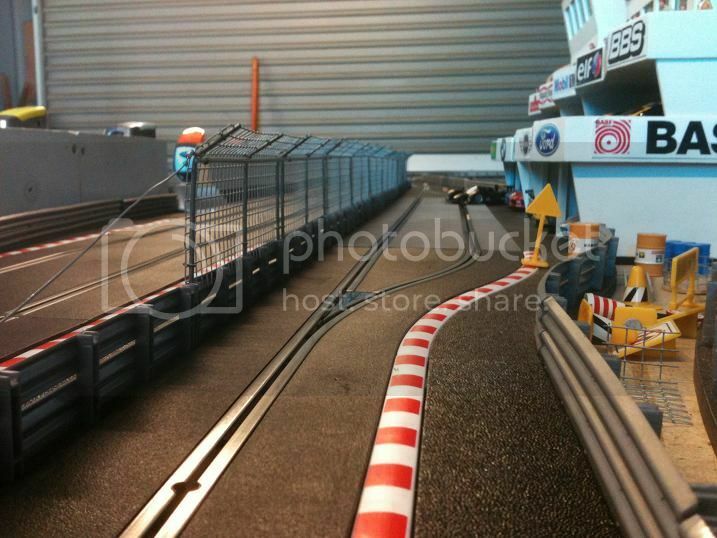 I've had a go at making some more safety fencing, this time for my pitlane. Heres a couple more pics. 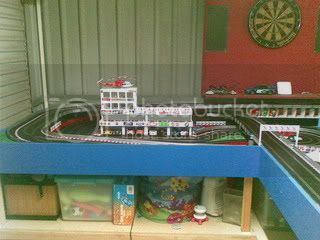 Still heaps to do on the layout, I have changed out the R1 corner and replaced it with a more sweeping R3 corner so the pace cars are happy again. 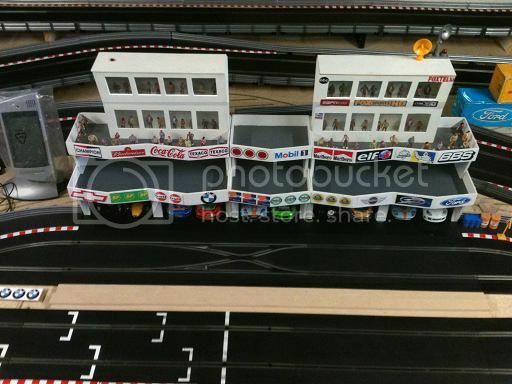 The pit lane is where I'll be doing most of the work at the moment because it isn't going to change in a hurry, I'll probably build an overpass from the APB to inbetween the 2-3rd tier buildings where I can add the start/finish signage,not sure how I'm going to go about that at the moment though. I like the track, very cool. 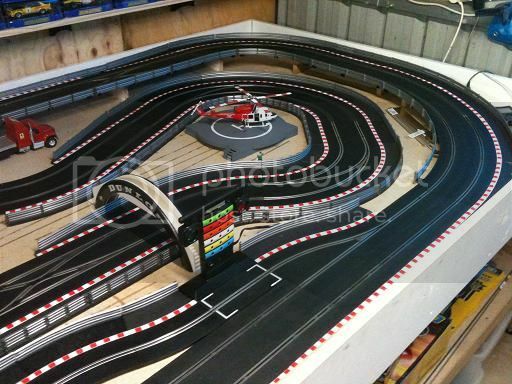 I have a few R1 corners in my track, and I think they make the race much more interesting. I find a track full of R2+ bores me pretty quick. Which software do you use to control your ghost/pace cars? I have just purchased SSDC but I haven't yet used the ghost car option, but it looks like it should handle R1 curves because it maps the users throttle over multiple laps, so I had thought the pace cars would have slowed down enough for the R1’s?